Large and muscular, with thick fur and tough skin. Powerful senses, including very adept vision in low-light. Aggressive warriors by nature, save for telepaths and females. Large retractable claws, powerful jaws with overhanging teeth. Aggressive nature and previous periods of war with other species makes them untrusted. "Honorable" expectations in culture can lead to prideful undertakings. Can be extremely instinct-driven at times. 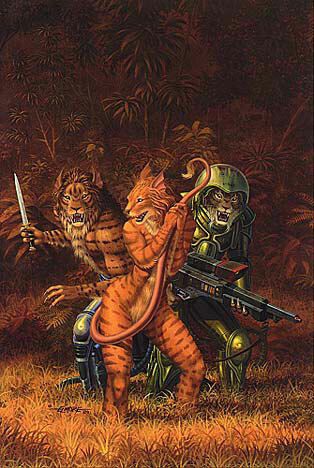 Two Kzinti males and a nonsapient Kzinti female, a "Kzintosh". 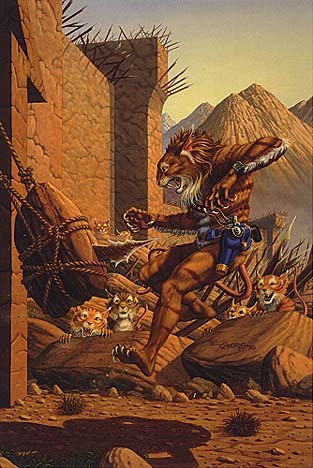 A Kzinti male and several Kzintosh.